AS FIRST MADE CLEAR by historian, political analyst, and Washington insider, Webster Tarpley of Rense.com, Obama’s foreign policy ‘god’ is master media manipulator and pathological Russophobe, Zbigniew Brzezinski. The technotronic era involves the appearance of a controlled society. Such a society would be dominated by an elite, unrestrained by traditional values.” View Entire Story Here. Brzezinski holds a chair on the Trilateral Commission which was founded by David Rockefeller. Both Rockefeller and Brzezinski, along with Robert Gates and Henry Paulson, comprise the new ruling elite in Washington as outlined by Tarpley’s Power Shift. “The Trilateral Commission is intended to be the vehicle for multinational consolidation of the commercial and banking interests by seizing control of the government of the United States. The Trilateral Commission represents a skillful effort to consolidate the four centers of power: political, monetary, intellectual, and ecclesiastical. As managers and creators of this system, they will rule the future.” View Entire Story Here. Mark Brzezinski: A partner in the DC office of McGuire Woods where he manages the international practice. He is Obama’s National Security advisor. Ian Brzezinski: Deputy Assistant Secretary of Defense for European and NATO Affairs and secret advisor to John McCain. Mika Brzezinski: Co-host of Morning Joe, reporter for NBC Nightly News, and MSNBC anchor. As events have unfolded since the “False Flag” operation known as 911 it has become clear that the Israeli Mossad pulled off this horrific assault on America to blame it on innocent Arabs. It was just another in a long list of attacks on the one country that gave Jews a free country to grow up in and enjoy freedom in. What was not clear however at the time was their organized attacks on the Christian religion. It wasn’t until 2004 that Rabbi David Feldman made his assault on Mel Gibson urging the Justice Department to “arrest Mel Gibson as a terrorist” for making the movie The Passion of The Christ. If you give tithes or offerings to any of these “anti-Christ ministries” or to a local church that is failing to sound the alarm for these last days, I urge you to change your giving to Brother Nathaniel. He is the one who has exposed the true anti-Christ movement for these last days. Those Christians who don’t study their own bibles have fallen for the deception of Hagee and Robertson completely and they are supporting the secular and terrorist state of Israel. The false Rapture Doctrine is what Satan used to pull off this deception. Abe Foxman of the Jewish Anti Defamation League is trying to get the New Testament banned as “anti-Semitic” or “hate speech.” You may think that such a thing can’t be done, but you’d better think again. We are facing the final battles of the war between Christ & Satan and Brother N needs your help to keep the information coming our way. He is exposing the attacks made on Jesus Christ by the Synagogue of Satan. So please do all you can to set aside one tenth of your income as tithe for Brother N or give what ever you can to his cause. We are going to see tens of millions of Christians swept aside by the deception of Satan as Christian ministers urge them to support terrorism masked as “the chosen people” when WE are “God’s Chosen People.” Anybody who trusts in Jesus Christ for salvation. The Time of Trouble is now upon us and Satan’s forces are crashing the economy so they can install electronic means of buying and selling. Once that is set up anybody who refuses to go along with the false religion they will install, will be cut off from the money grid that everybody will be using to buy and sell. The bankers are going to use derivatives to pull down the world economy and install their money system. They are not telling the public what this “derivative melt down” is about to do. It is so much money that the entire world doesn’t have enough money to prop it up. Hundreds of TRILLIONS of dollars. Iceland is already so bankrupt their banks are closed. When this wave hits the world will have no other choice but to set up a new money system, and that’s when they will change over to the computerized debit system using a tiny radio chip inserted in the right hand or forehead to buy and sell. When it happens it will happen over night and everybody will be caught off guard. You won’t have a chance to help Brother Nathaniel after that happens. The time for discovery and exposing the real threat from Satan will be over. So please do all you can to help now because there are good Christians and good Torah True Jews out there who need to be warned as to the great deception against God that is coming. Without money Brother N can’t continue to press on. Jews are certainly anti Christ , if he were in Israel today, they would burn him in oil . Yet John Hagee and his band of merry Satanists will be glad to give them a hand at it. Today Americans are only beginning to wake up to the fact that for 40 years or more,both the Democrats and the Republicans have looted raped and gutted the country with cold calculating greed and corruption as the sole motive. Today Americans are waking up- but they find themselves trapped like animals in a cage. The end game is now near and the outcome will be the destruction of the Constitution now hanging by only a thread and a prayer. Though Americans are muttering to themselves these days about the bailout little do they understand that these are the good old days compared to what is awaiting them. With a brigade of hardened soldiers loyal to the president ready to impose marshal law over the land.For what is coming is not only shocking it is demonic. Instead of teaching the American people and lifting the veil of darkness that has blinded Americans to the truth.they have chosen the route of keeping them in the dark. The bailout is only a down payment the money is going into foreign banks to repay them for the fraud perpetrated by wall street on the world. backed with a 100% guarantees, those guarantees are due. failure to pay them will render Americans destitute ,As it will cause all foreign investment to disappear from America.Something America can not live without today ,as America has been bankrupted long ago when the Vietnam war knocked the Dollar off the gold standard back in 1971-1972 it heralded the bankruptcy of America. have been foisted onto them with beer bottle goggles. push the reality into their faces ,knowing full well ;should Americans dare stand in the way of the planned coming North American Union ,the death of the Constitution and the reality of every president having been not related to the throne of England but their actual agents. The troops will not be back in time to save the American people .It is doubtful they will be back at all in your lifetime. Everyone in the world know what is coming for America,now bankrupted and unable to pay it’s debts ,WAR and probably ww3. there isn’t enough Oil in Iraq to cover the debts of America ,not even to pay the interest on this debt. they need the caspian oil Iran’s oil and Iraq’s oil for the Neocon plan to work. but is out of cash to buy. So yes if Obama gets in its war and more war but if Mccain gets in it is the same. will be the soup of the day. will be given their land . It is the only way for Mr Bush to save his legacy. He knows the history books will not be favorable to him otherwise. It is his last chance to go down as an American president who was a criminal. though it does not justify the things he has done ,it will be a chance for him to have something that will improve his standing immensely. the fleet in the Persian gulf and the Mediterranean may well be given the message attack but it won’t be Iran but Israel who is assaulted. this is my prediction I do not make many but I see that Mr Bush has no alternative to save his Legacy. it is his last gasping chance to substantiate his presidency. Watch it all unfold ,and see if I am right or not ! Maybe one day you will get past the puppet leaders you see and really get to the heart of the matter. Pretty much if you see them they are only puppets, except maybe for Rockefeller and Rothschild. If you people would only dig deeper you would be amazed at what you would find. This is a global problem, wake up now, all this “show” is for division among the masses, which seems to be working. You speak of the “false rapture” doctrine, evidently condemning the belief that some people will be “left behind” shortly to face God’s wrath and judgment; but by merely calling it false without providing a biblical basis for your argument is hardly convincing, and has been the order of the day. Christians who advocate an imminent rapture of the righteous are actually speaking of an imminent resurrection of the righteous - the words “rapture” and “resurrection” are actually understood to be more or less synonymous; and resurrection is of course a biblical doctrine upheld by all mainline churches. The fact is that the doctrine of a rapture or resurrection, leaving the wicked or unjust behind is prefigured in Old Testament texts, plainly stated in both the gospels and epistles on several occasions, and has been upheld by the so-called fathers of the church. You cannot read this scripture: “then shall two be in the field; the one shall be taken, and the other left. Two women shall be grinding at the mill; the one shall be taken the other left”, and say this is not a resurrection or rapture leaving the unjust behind to face judgment, without being condemned yourself as a heretic. For it is an apostolic doctrine upheld by the church fathers that a resurrection or rapture of the righteous precedes that of the unjust to judgment. Debate over the foregoing verse, and several other NT verses like it, is not a dispute as to whether or not righteous persons are to be resurrected or raptured leaving the unjust or unreconciled to God behind to face judgment; because anyone who can read, and uses the rules of language, which are not arbitrary, can work that out from the texts. The dispute centres on WHEN the righteous precede the wicked in resurrection; and in the context of an imminent social cataclysm of horrendous proportions and the revelation of the antichrist, it almost invariably comes done to a diffence in opinion by seven years. I’m aware that some Christans do not use the verses from the gospel of Matthew I’ve quoted above to apply to an imminent resurrection of the church, the body and bride of Christ, but to the resurrection of the righteous that convert after them during the biblical “great tribulation”, and/or to the righteous that will be raised after a thousand year reign of Christ, and that they only use verses in the epistles and the Revelation, but that is another doctrinal issue. The point I’m making is that it is not heresy and never has been to state that a resurrection or rapture of the righteous will shortly leave the unjust or unreconciled to God behind on earth to face judgment. Furthermore, the doctrine that there will be an imminent resurrection of rapture of the righteous, leaving the vast majority behind to face a social cataclylsm and the revelation of antichrist is stated by the apostle Paul … “and then shall that Wicked be revealed”. I am not a follower of John Nelson Darby, but I’ve read his works, and more than a hundred hard bound volumes of his followers, and I can tell they’re easily the most profound commentaries on the life of Christ and scripture in general, outside of the good book itself. Interesting isn’t it, that almost all who condemn Darby’s doctrine have never read his works, no doubt because they can’t handle the meat of the word. The so-called church fathers read the doctrine of the rapture or resurrection in the gospels and epistles, but generally declined to provide details on it; and I understand the book of the Revelation is not in the liturgy of the Orthodox Church. Obama is dangerous not for himself but for the people behind him. What policies do they have in mind? The oil will soon run out, does it mean they have in mind to severely lower the American standard of living? Do they, as some allege, plan the North American Union and the amero? Do they plan to just do away with the United States the same as with the Soviet Union? The idea that Obama is an independent personality is folly. His rallies probably are scripted just as his speeches, with paid actors providing the enthusiasm. But once he is elected, any critisism of him will run against charges of racism as a means to shut people up - we can see it already. Thus, do we elect a man without experience, without a base, without good moral fiber? Have we, in other words, gone insane? If we elect him, the people behind him, what will they do to the United States? In other words, people beware this unknown, dangerous character. The falsehood of the Rapture heresy stems from a misinterpretation of one of the chapters in the Book of Revelation: what “rapturists” consider to be an episode integrated in the flow of the narration is in fact a standalone and encompassing description of the period between the First and Second Coming of the Lord. I know the Gospels backward and forward. Please cite the qoute where you allege that Jesus said that we are not to stand in the way of evil. I do NOT recall Him saying this. Christ did tell us to turn the other cheek and to pray for those who despitefully use us. 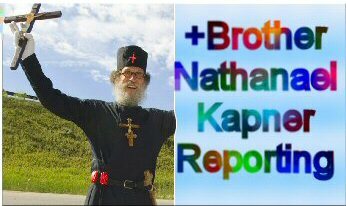 Brother Nathaniel, I too, have most of the bible memorized verse for verse, and the statement by “blue” is not in there. Ephesians 5:11 says to expose the works of darkness. Evil must be dissolved by uniting it with its opposite, love against hate, and so on. Matthew 5:43 to verse 47 say that when we are faced with evil we are to give love instead. It would appear that “blue” is a Freemason. Obama is a former communist and is shrouded with dirty linen by prior association. However, he is the best bet of the two candidates. McCain isa sure worse continuation of bushco. Obama, on the other hand personally has two obnoxious choices on which to turn tail. He must turn on Brezinski or he can turn on Louis Farakhan and Jesse Jackson. I am told by a close Moslem friend that he will embrace Farakhan and Jackson. According to Newsmac.com Jackson told israelis that Obama would mark the end of zionist control of Washington. I certainly dont endorse any of the above but would appreciate continued negotiation and conciliation than END AMERICA brezinski. Mr. Putin and Medevev are still a Christian trump card! There’s 35 of them all told. It is no secret that Obama’s candidacy has been supported financially and politically by many prominent members of the American Jewish community. Watch this one minute video of Bush promising home loans to minorities who are bad credit risks! To BN, you want to read this. Hal Turner is not a guy you will like if you think David Duke is no good, but he has also been taken down from webhosts like you. You should get the Jackson in this weeek. “Dearly beloved, Avenge not yourselves, but rather give place unto wrath: for it is written, Vengeance is mine: I will repay, saith the Lord. If thine enemy hunger feed him: if he thirst, give him drink: for in so doing thou shalt heap coals of fire on his head”. Good day to you brother Nathanael and God bless you and keep you I pray.I found this interested Profesor from Tel Aviv University by the name Shlomo Sand.October 9th,2008. Israeli Best-seller Breaks National Taboo. No one is more surprised than Shlomo Sand that his latest academic work has spent 19 weeks on Israels bestseller list and that success has come to the history professor despite his book challenging Israels biggest taboo. Dr Sand argues that the idea of a jewish nation whose need for a safe heaven was originally used to justify the founding of the state of Israel is a myth invented little more than a century ago. An expert on European history at Tel Aviv University,Dr Sand drew on extensive historical and archaelogical research to support not only this claim but several more all equally controversial.In adition, he argues that the jews were never exiled from the Holy Land, that most of today jews have no historical connection to the land call Israel and that the only political solution to the countrys conflict with the Palestinians is to abolish the jewish state.The succes of when and haw was The Jewis people invented?? looks likely to be repeated around the world. A french edition,launched last mounth,is selling so fast that it has already had tree print runs.Translation are under way into a dozen languages,including Arabic and English.But he predicted a rough ride from the pro-Israel lobby when the book is launched by his English publisher,Verso,in the United States next year. What do you think brother Nathanael about this? Does the Book of Revelation 2:9,Revelation 3:9 tell us the truth, of course it does. God is not a liar. Have a nice day and in few days I’m going to send you some money. God bless you. Avenging ourselves is one thing. To ignore evil and do nothing about it is another. Christians are to SPEAK OUT against evil. PERIOD. St Paul encouraged Christians to “crush Satan under their feet” as he wrote in Romans 16 referring back to the original promise of the Messiah’s triumph over evil in Genesis 3:15. There’s also Mathew Brezinski the handler for Zbig’s Chechen terrorist foreign minister in Washington and I think there’s also another Brezinski but I can not remember who he is and what position he operates. Obama as a president might be worse than McCain as McCain might have went after a disastrous war against Iran first getting the US bogged down there and strengthening Russia as oil prices would increase. I recently watched Zeitgeist the movie and the first part is about how Christianity is a culmination Egyptian and other theological and spiritual belief. On the surface It makes a pretty convincing argument do you know anything about the information he is talking about. Hoff, Mr. Turner is a false front for the powers that be. His prior website incited radical violence, and other activities that easily could have resulted in FBI or BATF annihilations on the part of some posters to his site. Moreover, the utter vulgarity one encountered in his writings was the sign of an unintelligent, or at best, warped mind. I believe he is an unrepentant Deicide as well, so that would fit in nicely with the questionable activities of such a shady character. Run, do not walk from Hal Turner. WARNING! WARNING! GULAG USA! GULAG USA! Brother Nathaniel, another excellent piece. I have a question though, and perhaps as a former Jew you have some insight. I have seen many Israelis on the web recently attacking Brzezinski as an “anti-semite” and architect of Islamic terror. It seems there is a fairly substantial continent of “conspiracy theorists” in the Jewish community who fear Brzezinski. They claim that he is responsible for Ahmadinejad’s invitation to Columbia university, among other things. Yet I found on wikipedia that Brzezinski’s father was honored in Israel by Begin for saving Jews during the holocaust… I found this strange. Should we put any stock in Israel’s fear of Brzezinski? Do his trilateralists oppose Jewish hegemony in some way? Or is this all just wagging the goy? It seems to me that Brzezinski must be in league with Rothschild, is it possible that there is competition among the factions that make up the elite? No wonder Abe Foxman is so worked up on banning the New Testament. Although the House of Rothschild is behind it all in the End.